>The boys have been playing with their Leapster 2(3 year old) and Didj (5 year old) since the winter holidays. First and foremost, they were just the greatest things to have on the plane for our trip. We have pretty strict rules about handheld gaming: no playing when friends are around; no playing at home; only play on long car rides; no playing in restaurants. All these rules make the games more exciting and less ordinary, every-day playthings. Leapster2 was created for ages 4 and up, which means many parents are buying for their 3 year old. The machine itself has been great for teaching proper use of pencil (it has an attached [thank goodness] stylus) and hand-eye coordination. We still haven’t hooked it up to the computer, I’m not interested in tracking his skills. Though when he’s old enough for testable skills in elementary school, I’m sure I’ll love the feature for downloading spelling lists and math facts. Leapster2 fits nicely in his little hands and didn’t take long for him to learn. While my five-year-old loves it, my 3-year-old is proud of his ownership of this toy. He’s not a fan of playing on the wii or other TV games. He is, however, all about the Leapster. –Wall-E. Based on the movie baring the same name, my 5 year old does a bit better with Wall-E’s activities than the 3 year old. Though, as I keep reminding them, it IS the 3’s game. All the same, as soon as he saw this game, the little one knew this was the game he wanted to play. And it was hard to get him to stop trying. He still hasn’t completed much on this one. It teaches math, science and a bit of letters. Created for ages 4-8. –Creature Create. It took a while for the 3 year old to even want to play this game. I don’t know if the packaging wasn’t inviting or if he was just too attached to the other games. Perhaps it was that from the packaging and title it wasn’t clear what this game was about. But. Once he played Creature Create (which he calls Creative Creative) he has hardly stopped. Its now his game of choice. Kids create a creature, then a creature’s home, then create puzzles from home they created to solve. Like Pet Pals, they take care of their creature. But rather than playing all the math and pre-learning and writing skills, the skills emphasized in this game are creativity, spatial reasoning, symmetry, colors, shapes and listening. Another perfect 3-year-old game, he could play this for hours. No doubt, this is his favorite! Through March 26, get free shipping on orders of $49.99 and more from Leapfrog. 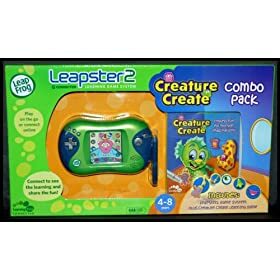 Amazon currently has Leapster2 with Creature Create as a bonus game for only $69.95. That’s a HUGE savings from buying them individually. Is the drawing function the same as the original Leapster. ( They can color pictures or create their own). My daughter played with an original Leapster and loved this part so I wanted to be sure it was still there.